This 2018, the 7-Eleven Run slated on February 4, is not just happening in Skyway and Filinvest, Manila like previous years, but, for the very first time, it will take place in Cebu Business Park, Cebu and SM City Davao, Davao at the same time. Our favorite kapitbahay will be bringing families, runners, and people from all ages together for another day of freebies, fitness and fun. Run 2018 Cebu will feature 8 categories this year, where participants can choose from 3KM race up to an intense 42KM race. In between these two categories, Cebuanos can also join the 5KM Buddy Run, 5KM race, 10KM Buddy Run, 10KM race, 16KM race, and 21KM race. Meanwhile, the Manila and Davao events will have nine and seven categories, respectively. Run 2018 is also made possible with 7-Eleven’s unique system of self-selected wave starts, allowing participants to choose their wave start and run with people of the same skill or speed. 3 winners in each category will be announced on the race day, and will receive cash prizes and medals. In addition to this, the overall top 3 Filipino male and female placers from all 3 locations of the 21KM and the 42KM categories will also get the chance to join an International Marathon in Asia, all expenses paid. Registration is done online at www.run711.com and payment is course through any 7-Eleven store within 48 hours. Race Kits can be claimed on the date indicated on the receipt, and from the same store where payment has been made. 7-Eleven Run 2018 is held in partnership with Skyway and Filinvest, and exclusive sportswear partner, Asics. The event is also brought to you by Selecta, Nature’s Spring, Summit, Gatorade, Del Monte, Fit ‘N Right Isotonic Drink, Cheetos, Aquafina, Pocari Sweat, Evian, Kopiko 78, Le Minerale, San Miguel Beer, B’lue, Sip Purified Water, Sosro Fruit Tea, Milo, Safeguard, Grab, and Caltex, as well as media partners, Cignal, Hyper, Smart, ABS-CBN Publishing, Philippine Daily Inquirer, Manila Bulletin, Summit Media, ESPN, and Solar Sports. Follow 7-Eleven Run Series on Facebook to get the latest updates. 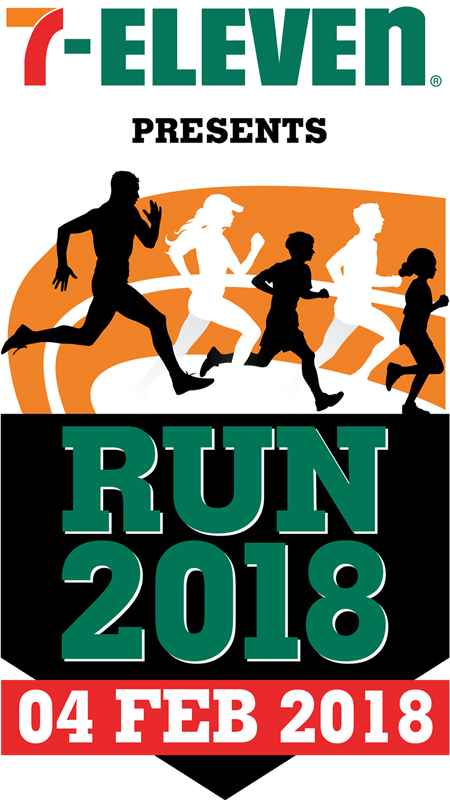 Use the hashtag #711run2018 and join in on the conversation. 0 comments: on "7-Eleven Run 2018 races in Manila, Cebu & Davao of February 4"